When I was in high school, the best guitar player around was this kid named Chris. He was a couple years older than me, and as far as I could tell, Chris knew everything about playing guitar, whereas I knew next to nothing. So I bugged him any chance I got, which wasn't often, and every now and then he'd say, "o-kay," heave a sigh, and show me something amazing, like a diminished chord or part of a Beatles song. And it always felt ten times more vivid and memorable than any scale pattern or chord box I had read out of a book. I wound up being a pretty math-y kind of guy when it comes to theory, and can totally nerd out on how all that stuff goes together. And I covered a lot of those kinds of details in my "The Practicing Blues Guitarist" online workshop and in my "Six Steps to Playing The Changes" series on Youtube. But as a change of pace, I thought it would be cool to make a course that delved less into the theory and just focused on how playing the changes on the blues looks in real life. 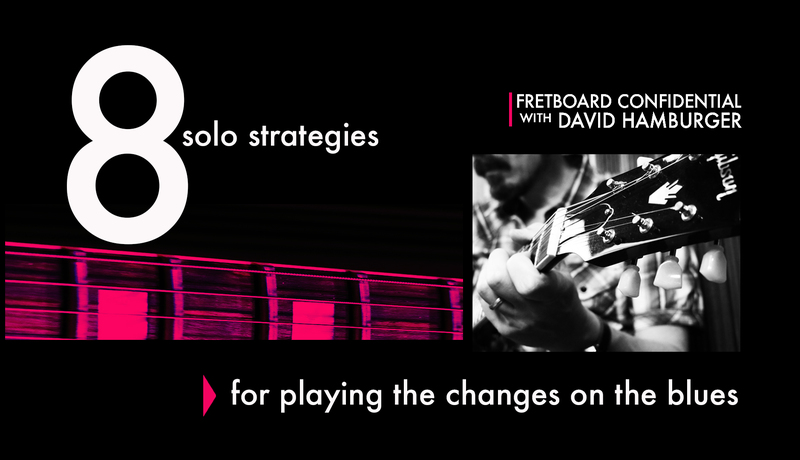 In my new course, "8 Solos Strategies for Playing the Changes," I've tried to make each lesson feel like I'm just sitting down with you and saying, "well, you could do a chorus like this, for instance." And then, instead of splitting for chemistry class a minute later, I actually stick around to break down what I'm doing line by line so you can really understand it. Each lesson features one chorus on the blues played up to tempo, explained in detail, and played slowly as well. I've included the complete Lesson 5 video above so that you can kick the tires a bit. Even if you pass on the course, I hope you get something out of learning the solo in this lesson, which includes some cool chromatic and altered licks.